1Do I keep the rights to my work? Yes, you retain the rights to your work. Per the Hybrid Global Publishing Terms of Service Agreement, you grant to Hybrid Global Publishing the exclusive license to print, convert to digital format, publish, distribute, market and sell your book in all and in all languages throughout the world. 2Does Hybrid Global Publishing file for copyright protection for me? 3Will Hybrid Global Publishing make two finished copies available to me for filing for copyright protection? 4Who is responsible for getting permission to use previously copyrighted material in my book? 5My book was previously published by another publisher. Can it be published by Hybrid Global Publishing, too? 6My book was previously published by another publisher, can I use that original cover design? 1How much will the Hybrid Global Publishing process cost? 2How much will it cost to print my book? 3What services do you offer? Hybrid Global Publishing offers a full range of editorial, production, conversion to digital format, printing, publication, promotion and worldwide distribution services. Custom Services are also available including social marketing, Amazon Bestseller list, virtual book tours, author website development, etc. 4Must I register as an author prior to launching a title? 5How do I register as an author? Author Registration is completed via the Hybrid Global Publishing website or sending an email to Karen@hybridglobalpublishing.com. 6Will I be assigned a customer service person? If so, how does that work? 1What is a Basic ePub edition? A Basic ePub edition is the digital format of a book that is primarily text with no enhancements (such as video or audio) and with fewer than 10 illustrations, footnotes, sidebars, boxes, tables or other “elements” that require manual manipulation as part of the conversion process from print file to an ePub file. 3What is an enhanced ePub edition? An enhanced ePub edition is an eBook that has been "enhanced" with new features not included in the print edition. Enhanced eBooks usually include video, audio or some interactive feature that is made possible by the technology of the digital format. Conversion to an enhanced ePub edition is offered as a Hybrid Global Publishing Custom Service. 4What is a fixed-layout format eBook? Fixed-layout format eBook editions, as the name implies, are fixed layouts. This means that the user cannot control the look of the display; the book will not re-flow on a mobile device for example. This format is suitable for books with illustrations and text that must travel together (science books, children’s’ books, for example). Conversion to a fixed-layout format digital edition is is offered as a Hybrid Global Publishing Custom Service. 5Will the URL for my website be embedded in the digital editions? DRM, the acronym for Digital Rights Management, is the set of usage rules and permissions that is attached to a digital edition to control the user’s ability to print, copy, share, etc. 7Can I choose to make my title available in eBook only? 8Is the retail price of an eBook the same as the print edition? Not usually. The eBook price is typically lower than print edition prices. The Hybrid Global Publishing team will discuss setting the retail price of the eBook edition, as well as other formats, with you. 9Will I have the chance to review the ePub edition of my book? 10Will the eBook edition of my book be published at the same time as the print format? 1What does "channel distribution" mean? 2Will my title be available in libraries? Yes. Hybrid Global Publishing distributes through the major library wholesalers. Any library can order your book directly from us or from any participating wholesaler. 3How can my local bookseller/library get copies of my book? Local booksellers and libraries can order your book through their wholesaler of choice or directly from Hybrid Global Publishing. 4Will my book be available internationally? Yes! Hybrid Global Publishing provides global distribution for print and eBook editions of all titles. 5Will my eBook be available on iBook? Kindle? Kobo? Nook? Sony? YES! Hybrid Global Publishing provides comprehensive eBook distribution, which includes availability on iBook, Kindle, Kobo, Nook, Sony Reader, among others. 6How will I know when my book is available for sale in bookstores and on Amazon & B&N? 7My book has been published — why is it not yet on B&N or iTunes? 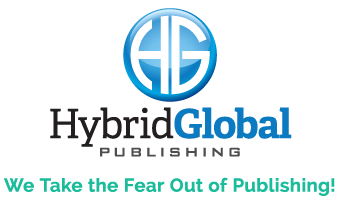 Hybrid Global Publishing submits the eBook files and metadata to wholesalers and retailers with a publication date. Each retailer and distributor has a different internal process and, as a result, sometimes books are displayed on different sites at different times. 8How should I market my book? That depends on if you want to sell your book through speaking engagements, to people in your industry or to the public through bookstores and on-line retailers such as Amazon and Barnes & Noble. You should make sure you know who your target audience is and how you can reach them. That might be through social media sites such as FaceBook, Linked-In, or Goodreads, on radio or through book reviews. You may want to talk with your Author Relationship Manager (ARM) about the Hybrid Global Publishing Custom Services or consult with a marketing professional of your own choosing. 9I just got three great reviews and I want them to be included on Amazon, B&N, iTunes, etc, what should I do to make that happen? Hybrid Global Publishing alerts each account with updates in information — reviews, endorsements, testimonials etc. are individually submitted to each retailer. It is also recommended that you post these reviews on your Author Page on Amazon. 10I am going to do book signings at multiple stores, can I arrange to get the books to each of the stores before I get there? 11Can I bundle by eBook and print editions with a special price for the bundle on my Bookshop? 12How do I order copies of my book at the author discount? Contact Karen Strauss at Karen@hybridglobalpublishing.com to order additional books. 13How long will it take to fill an order? 1How often will I receive royalty reports? Sales reports and any royalty payments are explained in your Hybrid Global Publishing Services agreement. Refer to your HGP publishing services agreement. 3If a retailer like Amazon discounts my book, how does that affect my royalties? Your royalties are based on net receipts from each retailer based on the Hybrid Global Publishing Retail Discount Schedule. That figure is not affected by the price a retailer elects to offer to consumers. 4How are sales reports delivered? 1I've finished writing my manuscript, now what? 2What is a graphic asset review? When photographs and illustrations are included in a book, they need to be of a certain quality. When Hybrid Global Publishing is provided with materials for a book, we review those materials to be sure they are recognizable, complete and suitable for use. In the same way, when a file is sent to us that is said to be “ready for press,” we review it to determine whether it is, indeed, ready for press--meeting PDF X1a protocols (including no rich black or spot color on black & white interior files). 3What is a print-ready PDF? 5What is the dpi (dots per inch) requirement for illustrations such as photographs? 6Should color files be CMYK or RGB? These are the abbreviations for the colors of light used in representing full color on a device that renders transparent colors--a computer monitor, for example, or a photographic slide. They stand for red (R), green (G), and blue (B). Electronic files presented for use in printing book pages should be CMYK, not RGB. 9What is the difference between editing and copy-editing? 10Can I work with my own editor? Yes, you may work with your own editor to provide a completely edited manuscript. Hybrid Global Publishing provides Editorial Services as an option, not a requirement. 11What is the difference between copy-editing and proofreading? 12Do I need a copy editor? 13Do I need to have my book proofread? 14Hybrid Global Publishing offers Custom Services. Am I required to use those services or can I choose to hire others to provide those services? Custom Services are offered as options to facilitate your publication. Use of Hybrid Global Publishing House Custom Services is not required. You certainly may select any and all service providers yourself if that is your preference. If you are using your own editor or designer, you may want to coordinate them with your Author Relationship Manager (ARM) to ensure that their output meets publication requirements. 15What is metadata and why is it important? 16What does metadata distribution mean? Why is it "ongoing?" Metadata distribution means that a book’s descriptive information – author, title, ISBN, price, summary, author bio, etc. -- is disseminated to the largest wholesalers, retailers and online retailers. It is “ongoing” because Hybrid Global Publishing supplies updates and changes to all distribution partners to keep your metadata complete as reviews and testimonials are received and as you publish additional titles. 18At what point in the process do I need to have an ISBN? Hybrid Global Publishing provides the ISBN as part of your publishing package. 19I already have an ISBN, can I use it for my Hybrid Global Publishing edition? Yes. Let your Author Relationship Manager know at the time of Title Launch that you have purchased an ISBN so the correct number can be used to identify your Hybrid Global Publishing edition. 20Does every format need a separate ISBN? 21My book was previously published by another publisher, will I use the same ISBN on this new Hybrid Global Publishing edition? No. The Hybrid Global Publishing edition will be a new publication of your book and will require a new ISBN to ensure that orders are filled correctly. 22Do I need a barcode for my book? 23How do I get a bar code for my book? Hybrid Global Publishing provides bar codes for all print books that we publish and distribute. 24Does Hybrid Global Publishing file for a Library of Congress number for my book? 25What is a BISAC code and why is it important? 26What does “trim size” mean? Trim size defines the dimension (width by length) of the page of a printed book. In the U.S., it is usually expressed in inches. For example, a 6” x 9” trim is 6 inches in width and 9 inches in height. 27How is the retail price of my book set? You will set the Manufacturers Suggested Retail Price (MSRP), also referred to as the List Price, for your book. The Hybrid Global Publishing team will provide recommendations based on market knowledge and profitability. 28My book was previously published by another publisher. Do I have to keep the same price or can I change it? You are not restricted in any way by the price of a previously published edition of your book. You will set the retail price at the time of publication. The Hybrid Global Publishing team will make recommendations based on market knowledge and profitability and will set a minimum list price to ensure that the cost of the book and fees, if any, are covered. 29Can I set a specific publication date for my book? 30Can I publish my book in hardcover and paperback simultaneously, or must the hardcover be published first? 31Can I publish my book in eBook first, and then in paperback for marketing impact? 32I’ve completed part of my manuscript. Can I upload chapters or segments as I complete them? 33What's the difference between offset printing and print-on-demand? 36What is the quality of a book produced by print-on-demand? 37Are all print formats available in print-on-demand? 38Why are only certain trim sizes available through print-on-demand? 39Can a color book be produced in print-on-demand? 40Can a book with a color insert by produced by print-on-demand? 41Can I choose any kind of paper I want in print-on-demand? 42What are limitations of print-on-demand color printing? 43Is it possible to use offset printing in some instances and print-on-demand in others for the same title? 44If my first printing is an offset printing, does the ISBN change for the print-on-demand printing? 45Will I get a proof of my book prior to distribution? 46How long will it take to publish my book? Speed to market is one of the advantages of publishing with Hybrid Global Publishing. It can be a matter of weeks between when your source files are received and validated and when your book is available for sale in print and in digital formats. A good rule of thumb is to allow our team approximately 6 weeks to complete pre-press work; add to that the time required by you or a proofreader to proof two passes and to give approval. 47Can I update my text file after it’s been uploaded but prior to publication? 48If I choose to update my text file after upload, how do I submit the new material? 49Is there an additional cost if I update my text file after publication? Yes. Additional costs will be incurred both for any changes made by the Hybrid Global Publishing production team as well as for replacing files throughout our network of printers. 50Publication rights to my earlier titles have reverted to me. Can I re-publish them through Hybrid Global Publishing? Yes. We recommend that you check with your previous publisher to see if they can provide you with a print-ready file. They may be willing to do so for a fee that is less than the cost of scanning a hard copy of your book. Obtaining that file would also speed the publication process for the Hybrid Global Publishing edition. 51Rights to my previously published book have reverted to me. I have no files to upload but do have a hard copy of the first publication. Can a hardcopy be used as the source material for the Hybrid Global Publishing edition? Yes. We can scan printed pages of the previously published book. There are some limitations to this process, such as nability to easily make changes to the text as well as complexities converting to digital format. Scanning process is a Custom Service that incurs additional cost. Please contact your Account Management Representative (ARM) for further information. We recommend that you check with your previous publisher to see if they can provide you with a print-ready file. They may be willing to do so for a fee that is less than the cost of scanning and it will speed the publication process for the Hybrid Global Publishing edition.